Self-catering Farmhouse with 2 bedrooms and 1 bathrooms. Sleeps 2. Saturday changeover. 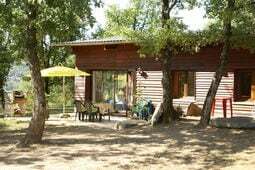 Self-catering Country house with 2 bedrooms and 1 bathrooms. Sleeps 6. Saturday changeover. 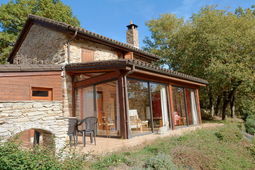 Self-catering Country house with 4 bedrooms and 3 bathrooms. Sleeps 10. Thursday changeover. Aveyron is in the rugged Midi-Pyrénées region of south France, it also forms part of the Massif Central. Peaceful lakeside resorts are an hour's drive from vertiginous peaks, waterfalls, and incredible chasms, under which flow subterranean rivers. Deep valleys alternate with limestone plateaus, meadows and caves. The Aveyron is rich in historical heritage with fortified castles, numerous tombes and remarkable Romanesque architecture. There is the Gallo-Roman centre at Graufesenque just outside Millau. The Viaduct of Millau on the A75 motorway is one of the most remarkable constructions of the beginning of this century. The highest point of this multi-span cable-stayed viaduct reaches 343 meters. Norman Foster designed this architectural marvel, it is the world's tallest bridge and an unmatched feat of engineering and green planning. 141 rural towns are recognised by the national association 'Most Beautiful French Villages', created in 1992. 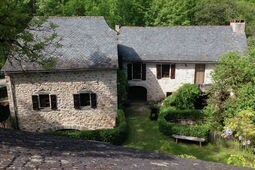 Proudly Aveyron heads the national honours list with 9 villages. 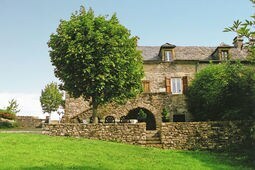 Aveyron offers spectacular landscapes, being south west of Massif Central. Its plateau called Causses have unique flowers and is surrounded by beautiful rivers like the Lot, Tarn, Aveyron and Aubrac which flow through magnificent deep gorges making it ideal for canoeists, walkers and naturalists alike. The area between the Lot and the Aveyron is called the 'Quercy Blanc' (its name is derived from the whitish soil). It is a series of ravines and twisting gorges creating beautiful scenery which has become a timeless land of ancient villages immersed in rolling hills and vineyards. There are hill top bastides, fortified villages with tiny, arcaded squares and ordered streets. The plateau of Segala is an area between the Tarn and the Aveyron and is a land of a hundred valleys and extends from the Levezou lakes to the valleys of the rivers of the Aveyron and Viaur. The hills of Levezou create a backdrop of wooded hillsides and pastures to five vast and beautiful artificial lakes covering 18000 hectares. The capital of Aveyron is Rodez, it is in the centre of the department and perfectly placed for visiting the whole of the area. It is built high above the river Aveyron and is dominated by the massive red sandstone Cathedrale Notre Dame which was begun in 1277 and was one of the first Gothic buildings in Southern France. The two main town squares Place de la Cite and Place du Bourg are linked by a network of well restored medieval streets. Villefranche is a beautifully preserved bastide founded in 1252. The oldest part of the town is a small network of streets set on the banks of the river Aveyron and dominated by the 14th century church of Notre Dame with a tower that is accessible for panoramic views. In front of the church is an arcaded market place which is home to a thriving market every Thursday morning. Najac is rather unusual in that although it is a small village it spans two hills. The pretty village is a single street that tails back from the hill to the valley overlooked by ancient houses. There are some incredible views of the ruined chateau on a separate hilltop as you walk down through the village. The royal fortress is set in an impregnable position and once defending the region's rich silver and copper mines. After a days outing why not sample some of the local produce - noticeably the fruity, red Marcillac wine or the superb Roquefort classic blue cheese, which has been matured in limestone caves and produced there since 1925. Roquefort itself is a very unprepossessing town. It is small with narrow and very steep streets dotted with vast tourist adverts for its cheese production and cave visits. The cheese is produced entirely from the milk of the ewes and ripened in the natural damp, aired caves found under the village of Roquefort-sur-Soulzon. The Cathedrale Notre-Dame at Rodez is well worth a visit with its ornate bell tower and pink stone façade. The Micropolis at Saint Leons is a novel attraction - part museum, part theme park based on 'insect life'. Interactive exhibits. The River Lot, its fertile valley flanked with vineyards, orchards & pine forests makes for enjoyable country walks . Millau Viaduct - a remarkable construction which touches the Tarn Valley at just 9 points. It is the shortest, quickest and least expensive route from Paris to the Mediterranean and Spain. Rodez-Marcillac (Airport code: RDZ) is located approximately 10km outside of Rodez. Flybmi for has flights from Manchester to Toulouse (1.5 hours drive). From Paris (Gare Montparnasse) there is a high-speed train (TGV) to Montpellier. From there rent a car for the 1½ hour drive to Millau, which takes you over the Millau Viaduct. Alternatively Najac is on the train line between Toulouse and Paris.